Interview etiquette is a tricky thing and even trickier is getting the follow up right. A hard thing that almost all job seekers have to face is the silence after giving a job interview. The time when there is no response from them is the toughest time. The waiting game goes on and it looks like it has been forever since they have kept you waiting. So, there you are, waiting even weeks later, after the interview and all anxious about it. You might be like hoping, gnashing your teeth and still haven’t heard from them, not a word and some of the people who seemed so friendly and cool, suddenly look like they are not the same people, you had met during the interview. And, certainly, no one warns you about this time period. No one teaches about it or discloses it in counseling sessions. Most of the people are mostly blind-sided about the topic and how to approach it. The lack of communication after an interview, they think went well, is certainly the most killing thing. If you need the job, you should appear keen. Keen, not over annoying! You should contact the interviewer or the agency which recommended you, as soon as possible after the interview and then thank them to show and confirm that you are interested in the position. No Call Back after Interview – What to Do? You should contact the interviewer or the recommending agency but how often? If you contact them again and again, you have a risk of being labeled as annoying. If you don’t contact them, you might give the impression that you are disinterested or that you have got another job. The key here is to strike the right balance. Do not lose the control on the conversation. Talk them into giving you a sure time and not an open ended waiting time where you remain unsure of the next step in the process or the time that you need to wait, further. When you call up the person, make sure you schedule the next conversation where you have a firm date and time when you can call them again. In this case, everyone will know when the next contact will be made and who is to take the next step. Hence, if you get a response that we will call you by the next week, you can ask that if you don’t get a call by the next week, shall you call on the next Monday or not. If after making a schedule you still don’t get the call and there is no contact from any of the involved persons, try to contact them through call. Mail is not the option at this point of time. When they pick it up, ask for the status or schedule the next talk. If the call is not picked up, leave a message indicating you are still very much interested in the position and that you understand that they are busy and could not attend your call. Just be polite and ask them to update you about the status. Remind yourself that you did the best that you could. Do not worry repeating the things you did and worrying that they could be wrong. It wastes your energy and brings your momentum down. It is not always about how well you did, it is about how far you fit what they are looking for. This might have been the perfect dream job and the only one that you had wanted but since you have given the initial interview already, you should realize that there are other jobs there in the market. Apply for them and that too with double the determination. It is better sanity wise that you keep going and also you never know what is best for you, still left to be explored. And one thing is for sure that when you get the second interview, you will get it with better energy. You should keep the momentum going; it could be through joining a new project or through joining a new organization. Take up a sport or a class- it could even enhance a skill that you might need for your new job. The worst thing that you could do is to just sit there and stare at your phone. Do not waste your time. Keep yourself busy and that too in a productive way. It helps in the interview also as sometimes you might be asked what you were upto during the waiting time and you can now tell them that you were honing your skills. You have this interesting thing to talk about rather than saying I waited for your call. 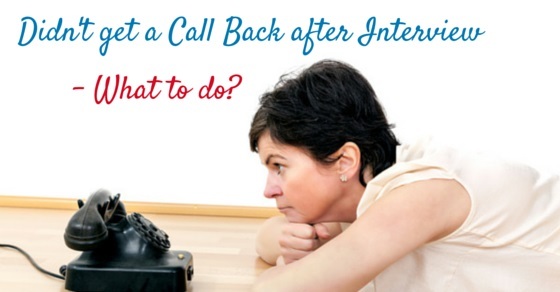 You are waiting for a call back from a company after job interview but that is no reason to stop networking. You might discover the next good job to go after, during this phase networking. And even if not a job, you surely will build connections for the next time. Networking will only add to your possibility of getting the job. Chances are that you might even meet someone from the organization you are awaiting a call from. So, there is no harm and only positive reasons to continue networking. So, go for it. The time that you get, you can use this to improve the covering letter and the resume that you are using. Although it should be tailored for each job that you apply for, still it helps if you can improve it. Another point is that you can use this time to work on the incidents like what was your best point, what problem had you solved, created a new process that any new employer would be willing to hear about. Keep reminding yourself about your strengths. Always remember that silence is not an indicator of things, not even of the fact that your chances of finding a job are slim or anything derogatory like that. Job search is a complicated and time consuming process which can take months and years, even for the most talented people out there. Always estimate and gauge the responses that you get before you outreach your efforts for the next call. If the reception is warm, you can take a chance. However, if its cold, it often indicated what you would not like to hear but have to. Sometimes, no answer is an answer in itself. Do not waste your time in persuading them. Rejection, though traumatizing, it may cause physical pain too, sometimes, but you need to be prepared for the worst. However, if your calls and mails go unanswered and unattended, your mind may give lot of rationale like they read your mails or they are too busy; follow your gut as probably it knows the answer and accept it. The sooner you realize it, the less it will hurt. Post interview process might not directly tell you about the company; however, it can, in such cases where there is absolutely no response from their side. You will definitely want to remember this in case they reach out to you in future or if you come across another opportunity from their side few years down the lane. The job might have been reduced in salary, terms of responsibility, or even eliminated. The companies might not want to broadcast such news to the public and might have opted for a safe route by saying nothing. Do not take it personally as you have the skills and one job cannot decide your worth. You will get other opportunities too. Just be patient. Keep in mind that getting no response from an employer can be one more additional point as to whether you would want to work for such a company in the future. A way in which you are treated during the interview is an indication of how do they treat their employees after getting placed. Even if the usual follow up process from your side doesn’t work, you have the satisfaction of getting a professional closure to it and the fact that you did what you could do. Now it is the time to close the door and move towards greener pastures, turn the focus to new opportunities. This time is not easy to pass and you should realize that it happens the same with everyone. All go through this at once in their life. Just accept it as part of job seekers life and learn to drive through it. All the best! Previous articleHow to Retain Employees after a Merger or Acquisition?